← 3.7 lbs of Sweet. Magic Bars. It seems to happen every school break. You survive until those last couple of days and then “POW” your body gives up. I am sick with a cold. So this will be short and sweet but we are off for 17 days for winter break (it’s not PC to call it Christmas break anymore) so I hope to post lots of recipes. Years ago I had a cake somewhere, maybe even in another state (of mind) that was a cranberry/orange combo. Haunting. Delicious. 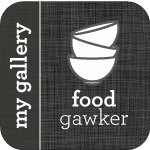 I still peruse my giant (Type A) binder, of tab divider organized recipes I’ve ripped from uptine magazines over the past 15 years, looking for something similar. 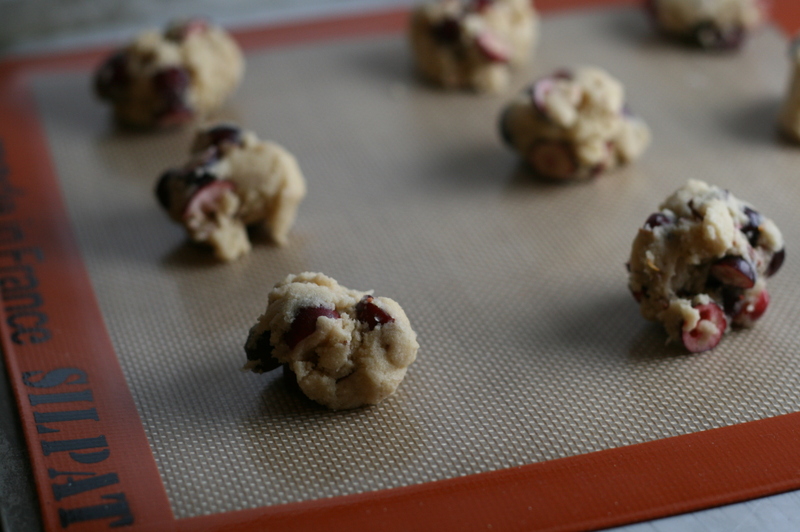 When I ran across this cookie recipe, I stopped… paused…. and thought, “Hmph, sounds pretty good.” I know you were waiting for something life changing. So these I baked a few weeks back, while perfectly healthly, and gave them out at my cookie exchange along with the Magic Bars. These were truly delicious. 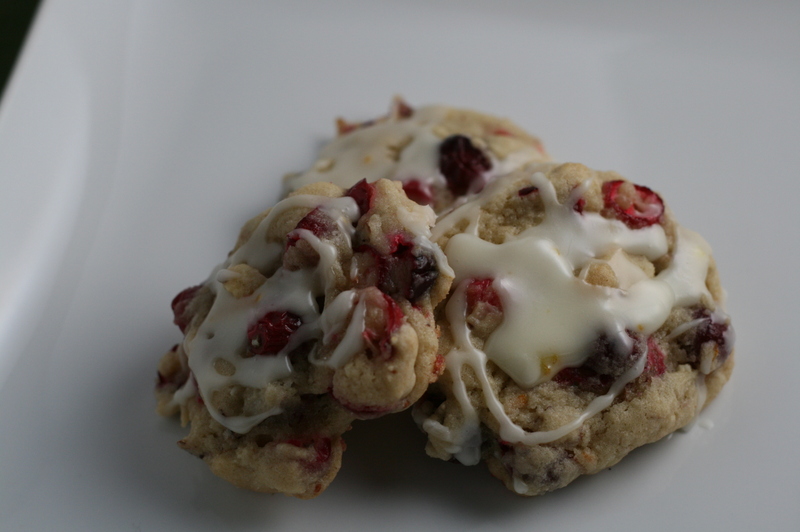 The recipe is super simple, the most strenuous part is cutting the cranberries in half. Took like a whole 15 minutes!! Eh Gads!! Sorry cold-induced sarcasm. We will proceed. I was a little worried that the cranberries wouldn’t soften up in the 12 minute baking time and they’d have an awful raw crunch taste. Oh no my friends, these cookies were soft, warm, lovely with a little crunch of almond and the sweet glaze over top finished it off perfectly. They are delicate and light. Sweet with a bit of crunch. So on to the recipe and some pretty pictures. Makes about 4 dozen smaller (2 inch) cookies. Printable Recipe click there, right back there, in blue. 2. In a large bowl, cream together the butter, white sugar and brown sugar until smooth. Beat in the egg until well blended. 3. 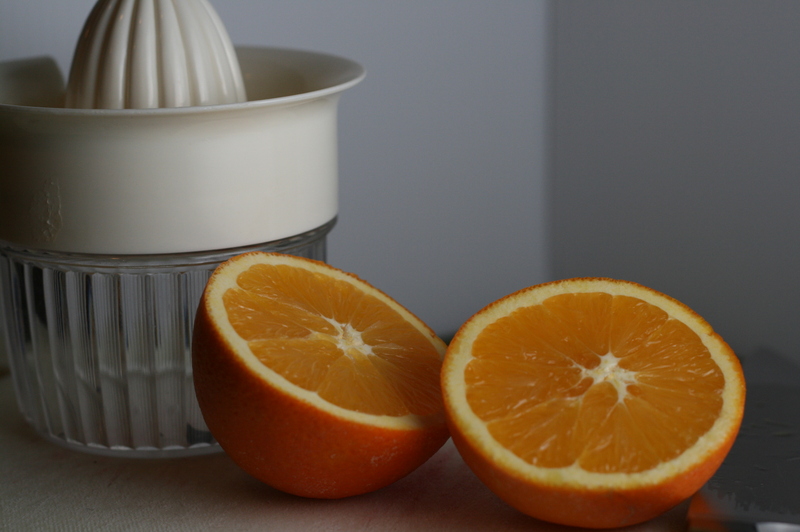 Mix in 1 tsp orange zest, 2 tbls fresh squeezed orange juice and almond extract. 4. Combine flour, baking soda, and salt. Stir in to the orange mixture. 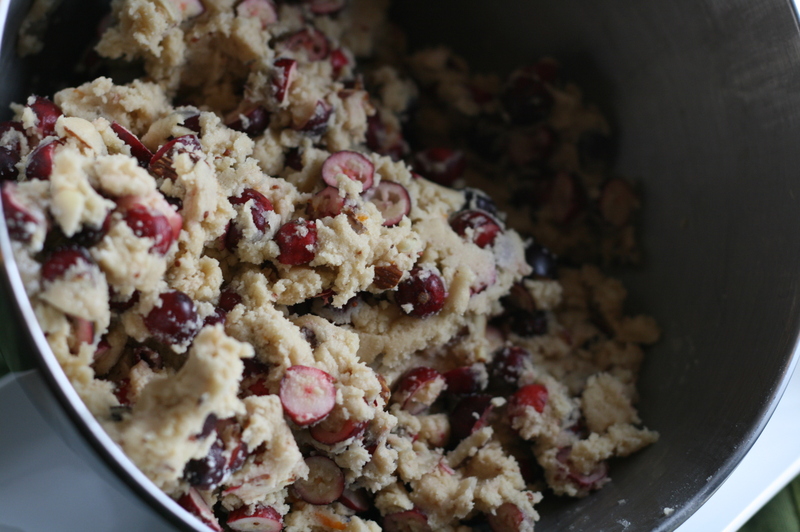 Mix in cranberries and slivered almonds, until evenly distributed. 5. Drop dough by rounded teaspoons. (The recipe said Tablespoons but I needed to get maximum cookie numbers out of this recipe. 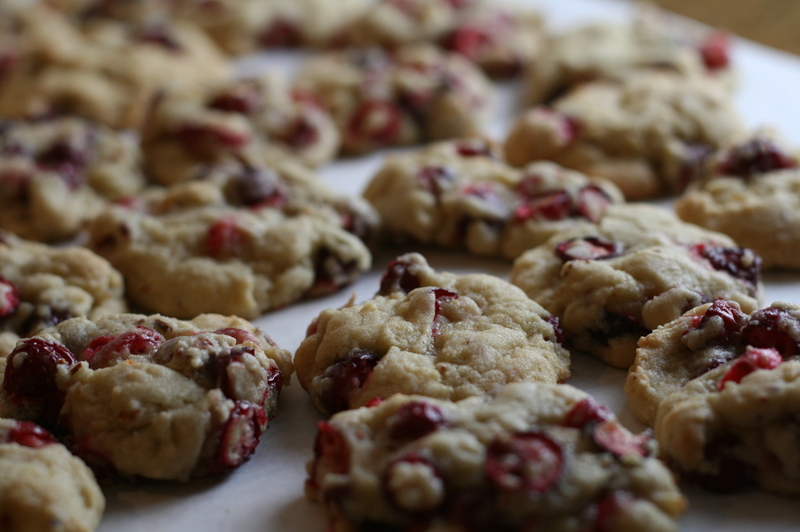 I ended up with about 4 dozen smaller, 2″ cookies. I think this cookie is so packed full of flavor that a giant 3-4″ gargantuan cookie would be a little much.) onto ungreased cookie sheets. Cookies should be spaced at least 2 inches apart. 7. While the cookies cool, make your glaze. In a small bowl, mix together 1/2 teaspoon orange zest, 2 tablespoons fresh squeezed orange juice and confectioners’ sugar until smooth. Take a spoon and channel your inner Jackson Pollock and drizzle over the tops of cooled cookies. Let stand until set. These freeze beautifully also. Bonus! Now my panicked task of the week- figuring out a menu to make for 15 people on Christmas Day. Panic! Sweat! Anxiety! When you’ve been toted as a great cook for years, it’s a task to pull off dinner for 15 with that sort of preempted reputation to uphold. Any suggestions for a stress free entree that will make me look like a genius and I won’t be having a panic attack? Off to finish my breakfast of cupcakes- Hey, I’m sick. Are you gonna stop me?! 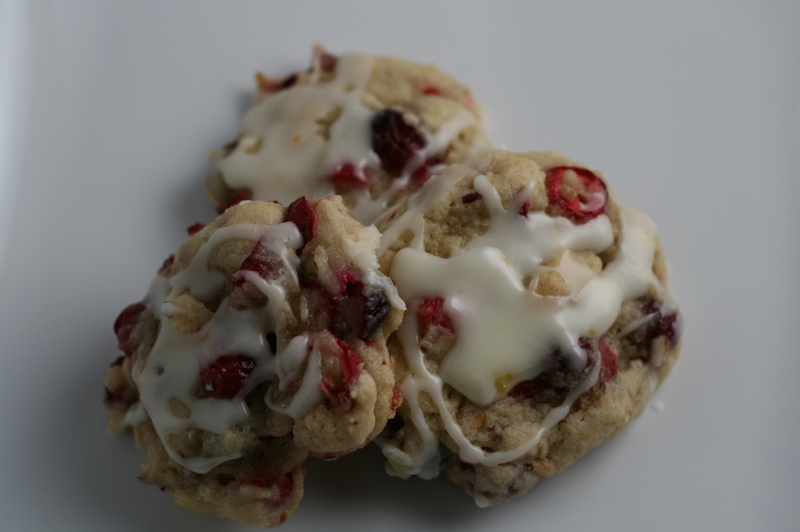 This entry was posted in Bread & Baking, Freezer Friendly, Uncategorized and tagged almond, baking, cookie, cranberry, holiday, orange. Bookmark the permalink. MMMM looks delicious. Are they tasteee?